Speed transfers up to 24 GB per minute. Non-PC based design, supports hot swapping. Data Sanitization: Quick Erase, Full Erase, DoD Erase, DoD Erase + Compare and Secure Erase. Supports M key and B+M key for PCIe / SATA M.2 SSDs. Supports SATA / U.2 / PCIe SSD / BGA SSD through adapter. Log report management records all task details for better enhanced management. PE series is a professional PCIe M.2 duplicator, specially designed for high volume duplication. U-Reach adopted a unique multitasking technology that can simultaneously copy 20 PCIe M.2 targets with a high transfer speed of 24 GB per minute. We guarantee the highest productivity without speed degradation even as the number of targets increases. 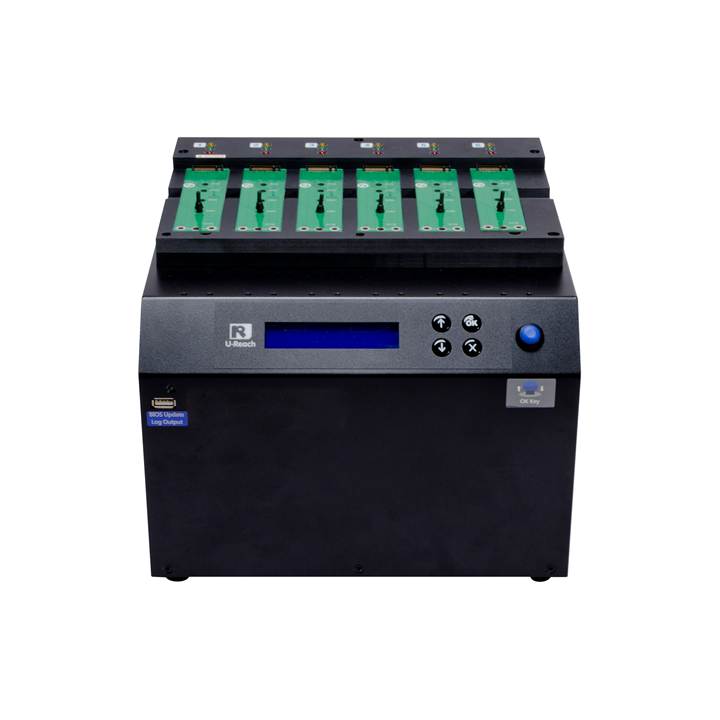 The PE series M.2 duplicator provides four copy modes: quick smart copy, all partitions copy, percentage copy and whole copy that all meet different duplication task requirements. The quick copy mode copies data and skips blank area. NTFS, Linux (Ext2/Ext3/Ext4), FAT/FAT32/exFAT and Mac (HFS, HFS+, HFSX) formats can all be supported with quick copy mode. In addition, the PE series M.2 duplicator is equipped with different levels of erase functions, Quick Erase, Full Erase, Secure Erase, DoD 5220 Erase government standards, which can fulfill different levels of PCIe wiping security. U-Reach PCIe M.2 duplicator copies at 24.0 GB/m on all PCIe M.2 simultaneously, without any speed degradation as number of targets increase. Whole Device Copy supports various partition formats. This mode identifies Windows (FAT16/32/64, NTFS), Linux(ext2/ext3/ext4) and Mac (HFS, HFS+, HFSX) formats. It will copy only the data and system contained area, which enhances the copy time. The PCIe series duplicator offers 3 ways of erase. 3. DoD Erase: Complies with U.S. Department of Defense erasure standards. Supported OS: Linux, Unix, Windows, Macintosh, etc. are all supported. Supports optional SSD to store images. Records operation time, each port’s process details, including SSD’s model, capacity, S/N, result (pass, fail). When the duplicator stops executing any function, the SSD Copier will automatically cut off the power of each port to protect the SSD from damage during removal from the duplicator. The power of each port will only be supplied when the operation is running. There are two modes of operation available for selection, standalone and PC-link operation, each meeting different demands. Standalone is excellent in simplifying operation and very user-friendly (all duplication jobs can be completed via input through 4 buttons). Copyright © 2013 U-Reach Europe Inc. All rights reserved.